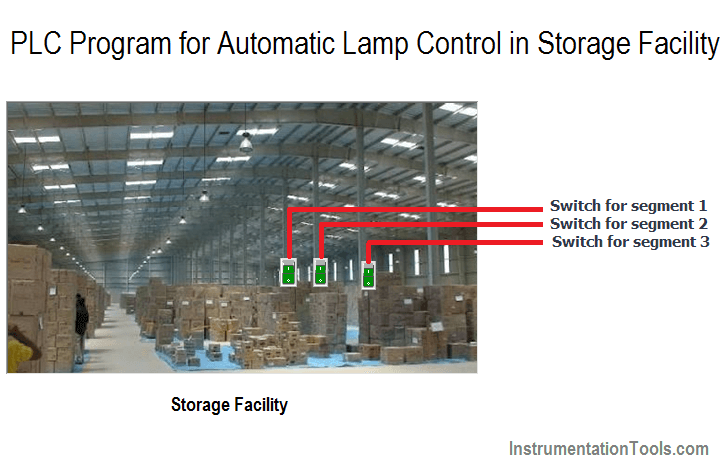 This is PLC Program for Automatic lamp Control in Godown (Storage Facility). In old process, when the person enters in the godown (Storage facility), he/she presses the switch and all lamps in the godown will be ON. If we turn on all lamps together then more energy consumption occurs. This problem occur in old process, so solutions is required for this process. We can solve this problem using simple automation or interlock system. We can solve this problem by simple interlock using PLC. As shown in figure, consider one godown (storage facility) for industry and there are couple of segments in the facility. For example, we have considered only three segments for the storage facility. Say here we have 3 lamps for 3 segments and 3 switches for operation. When Person enters the godown (storage facility) for some work, he will operate lamp 1 by pressing switch 1. when work will be completed then operator will turn OFF the light. Here we will provide interlocking system so person cannot operate other segment’s lamp until he stops the first segment lamp. Same case occurs in other segments. So by using this automation/interlock circuit, we can save energy. Note : This type of interlock applies only to some type of storage facilities as these operated by working in one segment at a time only before going to next segment in the storage facility. In above program, we have taken NO contact of SW 1(I0.0) for operating the Lamp 1 (Q0.0) and given NC contacts in series. so when user press other switches, Lamp 1(Q0.0) will be OFF. In network 2, we have written logic for Lamp 2(Q0.1). By operating SW2 (I0.2) operator can operate Lamp 2(Q0.1). And given NC contacts in series, so when user press other switches, Lamp 2(Q0.1) will be OFF. 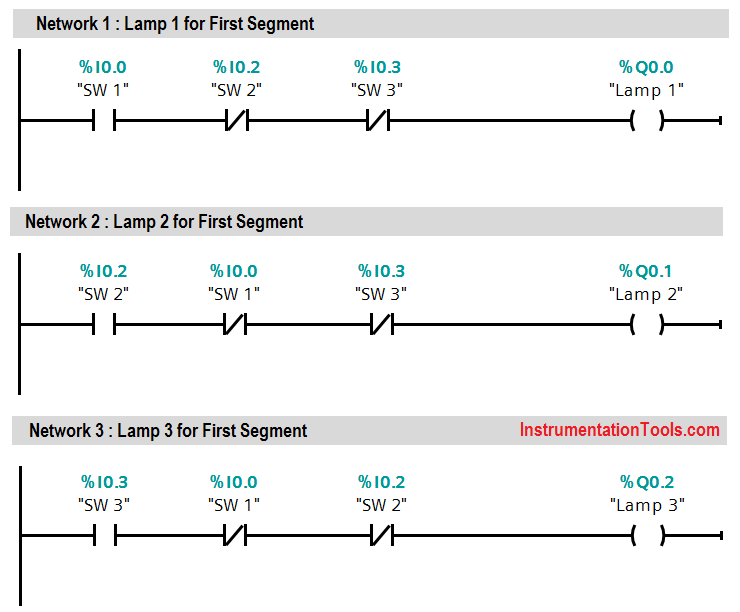 In network 3, we have written logic for Lamp 3(Q0.2).By operating SW3 (I0.2) operate can operate Lamp 3(Q0.2). And given NC contacts in series, so when user press other switches, Lamp 3(Q0.2) will be OFF. Note : The above PLC Logic provided for basic idea about application of PLC Program for Automatic Lamp Control. The Logic is limited and not complete application.